CHRIS MONTGOMERY TTN Junior business major Jake Daly stands in his home. Daly recently brewed his own Jalepeño lager. Home Sweet Homebrew serves as a Center City homebrewing mecca, with the supplies needed for every step of the process. As Philadelphians have tapped into the craft-brew scene in the last decade, the popularity of homebrewing has grown, too. For those looking to get acclimated to the process or perfect their brews, Home Sweet Homebrew at 20th and Sansom streets is a one-stop-shop. “[Homebrewing] has a lot of benefits, and it’s also a part of the way people like to live,” store co-owner George Hummel said. Hummel and his wife, Nancy Rigberg, bought the store in the early ‘90s. “People make their own breads, their own foods from scratch, and if you’re living that aspect in other areas of your life it kind of comes right into play,” Hummel said. The shop opened in 1986 and Hummel said that a lack of good beer available on the market at the time was the catalyst for the homebrewing trend in the mid-‘80s. Today, while many craft brands and imports beyond mainstream staples flow freely through the city, Hummel said there’s still a place for homebrewing, beyond acting as the sole source of quality beer. Home Sweet Homebrew has supplies for every step of the process, both equipment and ingredients, from barley to bottle. It also stocks some wine-making products, and both beverages come in prepackaged kits for novices. Hummel said customers come from a fair mix of expertise levels – from “people with grocery lists,” to first-timers looking for boxed kits, to people looking to build their own recipe based on the parameters of what they like to drink. Hummel is happy to explain and discuss the process with everyone because in addition to the products they sell, homebrewing guidance comes free. And both he and Rigberg are certainly the people to talk to on the subject – their credentials span further than the strand of ribbons won from years of competitive brewing that hangs in their shop. In 2009, Hummel’s recipe won a silver medal at the Great American Beer Festival. Although he said he no longer aggressively enters competitions, both his and Rigberg’s role as educators have been confirmed more formally. Their writings have appeared in publications including “Beer Philadelphia” and “Mid-Atlantic Brewing News,” and they’ve frequently spoken publicly on the subject. They received the Pennsylvania Governor’s Award in 2008. Hummel has taught beermaking classes at Temple and Drexel. Past clients include now-established microwbreweries, both local and national, including Victory, Flying Fish, Yards and West Coast establishments like Taps in Brea, Calif.
Hummel asserts that the opportunity to pass on his guru-like knowledge and interact with customers both plays into and is a result of the way the business operates. His knowledge, and eagerness and ability to share it is aptly a reflection of the delicacy behind the homebrewing process itself. A number of new fads regarding alcohol emerge in every generation whether it’s bootlegging, the rise of 40-ounces, or the sudden popularity of Four Lokos, however, this generation has discovered that the benefits of homebrewing can also include saving money and avoiding the frustrations of being underage. 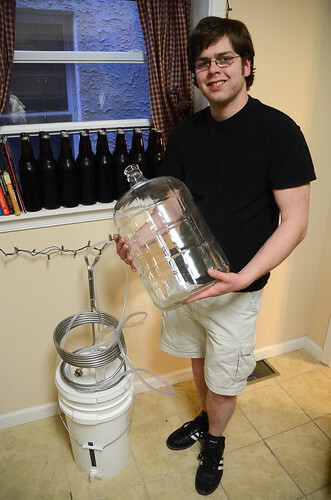 Thanks to directions fed through books, the Internet and easily purchased beer-brewing supplies, many students have taken to brewing in their own homes instead of paying high prices for a small amount of beer. Others, though, decide to self-brew for different reasons. Daly has been brewing since high school and started off with simple beers before moving up to more creatively flavored ones including his aforementioned Jalapeño lager. Junior biology major Gabe Bartlett also acknowledged the simplicity of the process. Bartlett only began brewing about a year ago, but unlike Daly, he did not start doing it because of young age. Daly said he’s purchased supplies at Home Sweet Homebrew in the past, as well as the online store Midwest Brewing Supplies. He spoke highly of his experiences at Home Sweet Homebrew. Both Bartlett and Daly mentioned brewing attempts turned failed experiments, and Daly spoke to the importance of keeping brewing equipment clean. “It really all depends on if you follow the recipe right, because you could mess up one thing and ruin the entire batch of beer you’re brewing,” Bartlett said. They both said that when the process goes smoothly it couldn’t be more satisfying. “It’s really cool to drink something you made and better when you have a party and everyone’s drinking your beer,” Daly said. “There’s nothing like sitting in a room with your friends and having them comment on how good your stuff is – it’s the best feeling,” Bartlett said. Alexsia Brown and Kara Savidge can be reached at artsandentertainment@temple-news.com. A bill to target voter fraud has seen support and criticism from political groups. Gov. Tom Corbett signed a bill March 14, which gives Pennsylvania one of the toughest voter identification laws in the country.